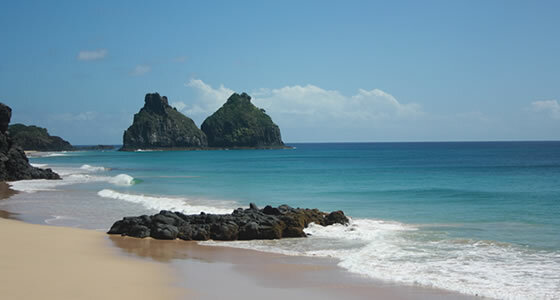 Praia do Americano Beach, Fernando de Noronha, Brazil. A perfect spot for surfing, the Americano Beach got its name from the Word War II. Praia do Americano is also known as the American beach. The beach got this name during World War II when the U.S military set up its base and brought it under the neighboring Boldro beach where they also had their Satellite Observation Centre. The Praia do Americano beach is a stretch of about 150m covered with fine clear sand. This beach also has some good waves breaking on the shore, making it a perfect spot for surfing during high tide. At low tide, the sea gathers to form small pools on the beach where it makes for a good and enjoyable swim. However, the beach is quite small and deserted, thus, good for tourists who want to sneak some private moments. You can just take a short walk or stretch on the fine sand to take a nap or just enjoy being the warm waters of the Praia do Americano beach. Don’t expect to find any food or drink on this beach because neither the locals nor many tourists prefer to hang around on this beach for long, except to catch some private moments. So if you still want to visit this beach, make sure to carry your own water and snacks.